The Low Inventory window provides valuable insight into various component types that may require a purchase order to be completed. From the available component types, you have the ability to choose capsules, case types, containers, cottons, cut bands, desiccants, ingredients, inserts, labels, lids, scoops or secondary packaging labels. Once your chosen component type is selected a new window will appear to provide more information. From this new window, any low inventory for your selected component type will be displayed. These entries can be sorted based on the component name, the amount on hand, the amount on hold, amount on order or the amount needed. 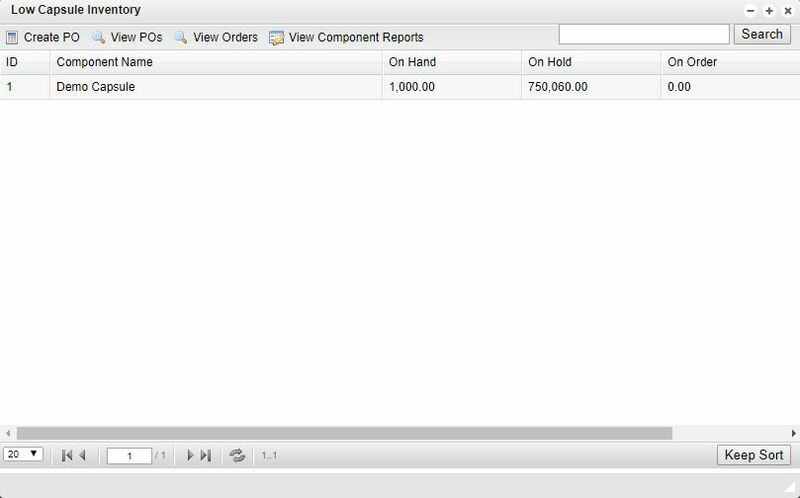 Once your desired component is selected you can then create a purchase order, view purchase orders, view current orders or view component reports by utilizing the buttons at the top of the Low Inventory window.